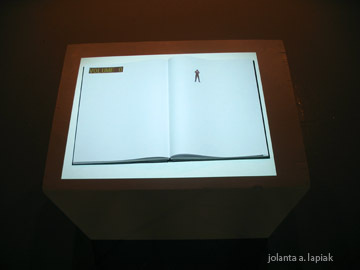 This installation speaking, reading, and/or writing is a video projection of a tiny black figure in motion onto an open sketchbook. The black figure is speaking/writing in Ameslan (or American Sign Language - ASL) as it moves in lines across the pages of the book. 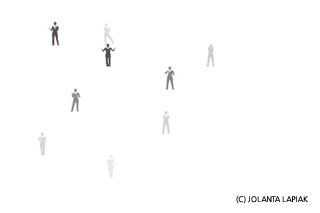 This work demonstrates the simultaneity of writing, speaking and reading. Installation: largest sketchbook, data projection system, 1:29min video loop. MFA thesis exhibition, 2007. My video work speaking, reading, and/or writing investigates the meaning and concept of reading and looking when perceiving a work. The opposition between looking and reading apparently correlate by distinguishing image from word, and art from literature. Neuroscience studies reveal that there are classical linguistic activities (Broca and Wernicke) in the left cerebral hemisphere in native signers like those found in hearing speakers. This suggests that the left cerebral hemisphere, which is assumed to be responsible for language, is not solely ruled by speech or phonetic writing. James Elkins points that "everyday reading and everyday looking... are not pure acts... Any act of reading relies on a finite number of customs and strategies, and they are often at work in looking. The converse is also true: We look at images in various ways... those ways of looking often come into play when we read... so there is 'reading' in every image and 'looking' in every text." My work plays the difference between looking and reading, blurring them, deleting the line at the same time presenting the line. This piece of work oddly presents a double level of reading - one is reading the black figure in Ameslan (space) and the other is reading the lines (time). However, as language fades out with the tiny scale of my body, it creates an experience of reading without reading. In a similar vein, one experiences reading without reading the invisible lines. and the complementarity of these statements. Arche-writing: James Elkins uses the open-ended term graphein, which means "to write, draw, or scratch.. when the divisions we are used to did not exist... picturing and writing are both kinds of 'scratching' -- that is, marking on and in surfaces." In this Derridean sense of archi-ecrit, architecture is yet another form of writing. Arche-reading: This work challenges the distinction of reading and looking when perceiving an object; the opposition between looking and reading correlate by distinguishing image from word, and art and architecture from literature. Elkins points out that "everyday reading and everyday looking... are not pure acts... Any act of reading relies on a finite number of customs and strategies, and they are often at work in looking. The converse is also true: We look at images in various ways... those ways of looking often come into play when we read... so there is 'reading' in every image and 'looking' in every text." Arche-speaking: Speaking of the term speaking, breaks from the logocentric notion of speaking as being central to speech. Rather, language is a function of embodiment. Neurological studies reveal that there are classical lingual activities in the left cerebral hemisphere in native visual-manual speakers like those found in vocal-auditory speakers. This observation suggests that the left cerebral hemisphere, which is assumed to be responsible for language, is not solely ruled by speech or phonetic writing. In addition to the left brain, studies also show that lingual activities co-exist in the right cerebral hemisphere in character readers and native visual-manual speakers. This questions the possibility of an act of reading "imagery."